The Software Supports Outlook 2016, 2013, 2010, 2007, 2003 & 2000 Versions. The Tool Is Compatible With Windows 10, 8.1, 8, 7 & Other Below Versions. The software is capable of exporting thousands of .msg files into .pst format. An unlimited number of MSG emails can be browsed with the help of our utility to perform bulk MSG to PST conversion. The tool is compatible with any Windows OS. 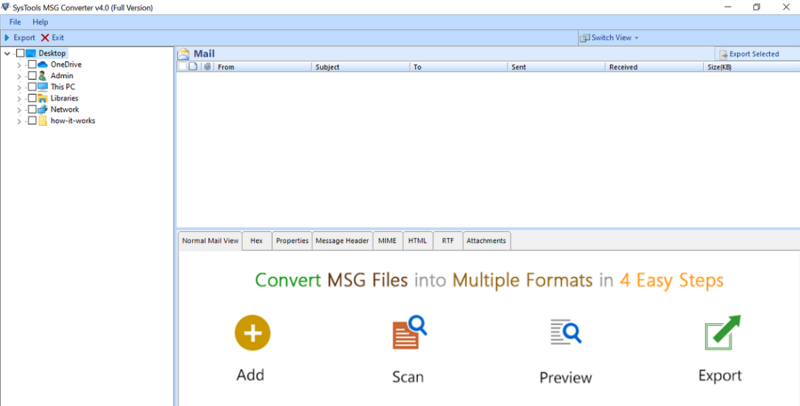 MSG Files to PST Converter allows you to view emails along with attachments in different styles. The tool provides viewing styles like Normal View, Hex View, Property View, Message Header, etc. You can preview the emails before the conversion process. The tool layout is just like Windows Explorer, where all the system folders automatically get loaded on the left-hand side of the converter panel. One just needs to click on the folder in which .msg files are stored to proceed with the conversion process. Instead of exporting all the loaded MSG files to PST, users can use selective email migration option. 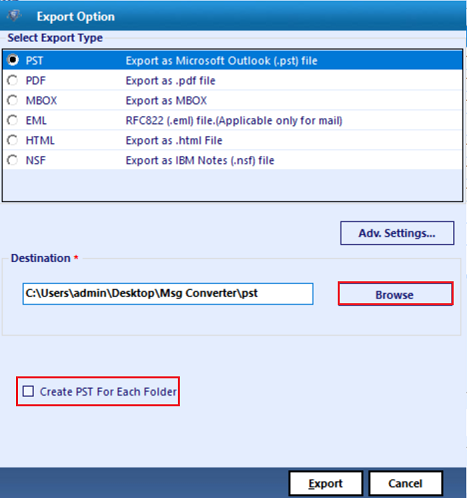 Select only those emails, which are to be saved in PST file format and then, click on Export button to proceed further. MSG to PST converter is offering a solution to break the resultant Outlook storage file. With help of this option, users will be safe from 2GB PST file size error, while importing output files in its respective email client. Not only emails without attachments but, Outlook MSG Files to PST Exporter converts keeping the same number and format of attached files as the original one. An email storage message file of Outlook is named as MSG file. It comprises of the entire information related to an individual email message including its header and attachments. Outlook users can create this file just by dragging an email message from parent application and dropping it on the desktop or any other destination path. Microsoft Outlook is one of the most popular used email applications in today’s date. Microsoft states MSG file as Outlook saved mail, and on the other hand, PST file consists data items of the Outlook mailbox. Security Aspect: It is flexible for Outlook users to copy content of MSG files and if the message is eliminated from its origin then, it will lead to data loss. Time Aspect: It becomes difficult to manage numerous MSG files and users can open only one MSG file in Outlook, at a time. Location Problem: If a person has forgotten the location where he /she had stored MSG file then, it becomes difficult to locate the path. File Merging Problem: It is difficult and complex procedure to merge numerous MSG files whereas it is easy to bring multiple PST files all together in one PST format. Explain the functionality of the software? Step 1: Install and run the application. Step 2: The software will auto-detect all the files in your system. Select the MSG files to export. Step 3: Now, you can see emails along with attachments in different viewing styles on the right panel. Step 4: You can select specific emails or select all the MSG files to export. Step 5: Select PST radio button and browse the location to save the PST file. Step 6: After complete export process, you can navigate to the destination folder to view the output PST file. Will I be able to move MSG files of Microsoft Outlook 2016? Yes, no matter with the version of Outlook MSG files. Our tool supports file of all the editions to export .msg to .pst. Is there any need to have Outlook installed on machine as supportive application for MSG to PST Converter? No, not at all, there is no need to have Outlook installed on your system to perform migration with help of our software. What is the maximum number of file size up to which I can browse MSG files for conversion with your tool? There is no maximum number of files limit because our Outlook MSG file to PST Exporter is free from all these restrictions. Is your software compatible with Windows 8.1 operating system? Yes, of course, our file converter is Windows-based program, which is compatible with Windows 10, 8.1, 8, 7 & other below versions. "I came to know about this tool while working on a social networking site. From my social networking website friends, I asked about the best tool to import MSG files into Outlook 2010 and majority of them recommended me to use this software. 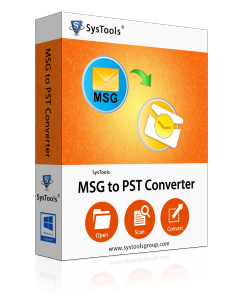 I can proudly say that MSG to PST converter is a rapid solution to export MSG files to PST without causing any harm to the data." "If someone is searching for Outlook MSG files to PST converter then, I am surely going to suggest this product because it is the best one among all available in the online market. The best part is the speed with which it works. It takes very less time to complete the process. The shocking factor is that around 1000 emails were migrated without any data loss in just a few minutes." "This tool helps a lot in converting MSG files to Outlook PST file format. I have thousands of Outlook messages that are in a backup form. But after few years, I need to access them in Outlook. So, I tried MSG to PST Converter software to export bulk number of emails along with attachments in Outlook. I am feeling thankful to the company. " "As a non-technical user, I was worried related to the conversion of MSG emails to PST file format. But it was nice using this application. 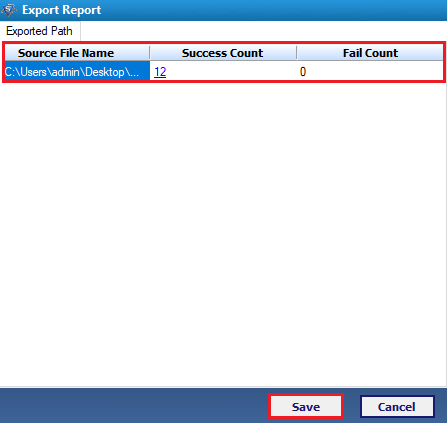 The interface of the tool is quite easy that it was easy for me to perform the export process. I must that the tool works really well. Thanks for such utility!"